Ring Sling is a quick, easy to use and lightweight babywearing option. Its great advantage is the fact that you do not have to wrap it. The only thing you have to do is to pull the fabric correctly through the rings, put the baby in and tighten it (according to the instructions). You can choose from single color, striped or more unique pattern in the following weaves cross-twill, diamond, herringbone or jacquard. The blends we offer are 100% cotton, cotton/bamboo, cotton/linen as well as combinations of yarn like silk or cashmere. 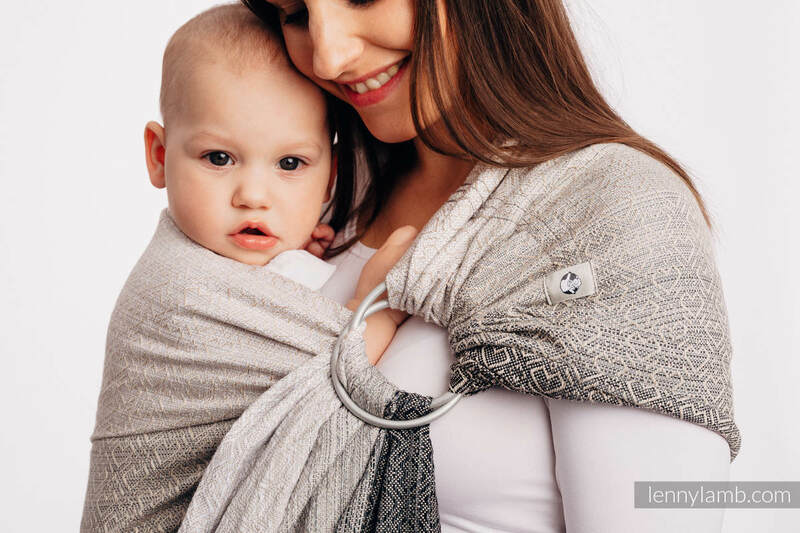 The LennyLamb RingSling has been acknowledged as a "hip healthy" product by the International Hip Dysplasia Institute. You can use it with your newborn baby in a cradle carry, but as soon as your baby can hold their head up you can also use the upright position. There is, however, a weight limit of 15kg. Available carries are: tummy-to-tummy and cradle, but it can also be occasionally wrapped on your back. LennyLamb RingSlings are made for the left shoulder as a standard.